Our friend, the Rev. Dr. A. Guy Waldrop, retired general minister of the Christian Church in Kentucky, says that he believes that the Christian Church (Disciples of Christ) is at the tipping point of irrelevancy. I admonish him by noting that it is not just our denomination, but virtually all of the historic denominations of the Protestant Reformation, the Roman Catholic Church, and even Christianity itself. Perhaps that is shocking to you, but I suspect, because you are here, and not at Southland Christian Church this morning, that you already had intimations of the truth of the assertion of proximate irrelevancy that both Guy and I are making. The reasons for our near irrelevancy are relatively clear: too many Christians cannot articulate with clarity, reason, and persuasiveness, just what it is that the faith has to offer. Too many churches and too many people are stuck with a fifth grade Sunday School set of ideas, that they can no longer describe, much less suggest might have any persuasiveness in the modern world. Pollsters tell us quite regularly that young adults are abandoning Christianity because they are turned off by the versions of it, most often now presented as the face of Christianity in the media, that seem to be opposed to reason, opposed to science, narrow-minded, dogmatically rigid, judgmental, bigoted, and exclusivist. Into this context, the words of Paul in the letter known as Ephesians may have some wisdom to offer us, and some hope. First, note that Paul writes from prison. It is worth noting that Paul stood for something over against the status quo of existing religiosity and secular power, rather than trying to get along by going along. But note also, that he says he is a “prisoner in the Lord”, which is to say that his heart, soul, and very life are captive to Jesus, and like any prisoner, must obey the one who rules his life. Second, we also should remember that stays in prison, or a place on the edges of culture can often hone and deepen understanding of the human condition and give insights for hope. Letters from captivity, such as Ephesians or Philippians in scripture, or like Martin Luther King, Jr.’s Letter from a Birmingham Jail; or Dietrich Bonhoeffer’s Letters and Papers from Prison; or Viktor Frankl’s book, Man’s Search for Meaning, derived from his time in a Nazi concentration camp, are all profound meditations on the meaning of faith in critical times in the life of an individual or a culture. Many spiritual awakenings happen in jails, which is why I hope, on one of our Moment for Mission Sundays we will be able to hear about the Disciples of Christ congregation inside Luther Luckett Correctional facility in LaGrange. Third, in the very first sentence, Paul pairs the words, “called” and “calling”. The readers are reminded of the grace of God to touch their lives, no—more, to invade their lives—with a sense that there is something sacred, holy, that shapes us and that connects us to Being itself; a sacred power calling out to us to be in relationship with holiness itself, whom we call God. There are, we must admit, many people who don’t seem to have a religious bone in their bodies, or who, for whatever reason, seem not to have a sense of the sacred mystery at the heart of life. They don’t feel “called”. Such folks strike us as callous; as self-centered; and lacking in empathy. They have no qualms about taking salaries, for example that are 500-600 times greater than their employees; or maybe they feel entitled to a little adultery or hanky-panky with their travel allowances; or perhaps they are inclined to think that the people around them, their families for instance, can’t be happy and healthy, unless they are first happy, whatever that means. By contrast, I’m inclined to think that happiness derives from a sense of being loved and being an integral and worthy part of a community more than from what we have, or what we think we are able to do. They may, perhaps, even think that their lives, and their successes are entirely self-made. Grace, you see, is that power, that mysterious action of God, that reminds us that we can’t make it alone; that we stumble; that we are part and parcel of families and communities that shape us; that there is a holiness about everything that if we ignore, will leave us in hell. An awareness that one’s life has not merely been touched by occasions of grace—of being loved in spite of one’s errors and selfishness—but that life is embued from beginning to end with grace—provides certain other attitudes that branch off of grace: humility and gentleness, patience, a willingness to bear with others in philia, love—as of a brother or sister, a member of one’s family—and a willingness to maintain “unity” in the bond of peace. These characteristics represent the core behaviors related to the concept of civility. I’ve been reading Stephen L. Carter’s marvelous 1996 book, Civility. Carter suggests that civility requires two behaviors, which must also be inward attitudes: first, a willingness to sacrifice something of the self for the sake of relationship with the other; and second, generosity, which is a forbearing spirit of kindliness toward others. Carter’s arguments for civility sound very much like the Apostle Paul’s statements about the sort of “lives” those of us who have been touched, or more deeply, have been made captive to the notion of holy grace, are called to live. In the same vein, persons who have “manners”—like those our parents tried to instill in us—are known as “gracious” people. Fourth comment about this text: Paul has begun his epistle with a statement of belief that the intention of God, or we might say the holiness at the heart of being, is that all things in heaven and earth might all be gathered up into Christ. To clarify what that might mean in more modern language, I suggest that Paul believes that in Jesus a model is offered to the whole world for hope—hope for forgiveness, hope for human unity and peace, that we all are “justified by grace”, and not by our works, our good deeds, our successes. It is grace by which we receive wisdom and grace that gives us hope. So in verse 6 of chapter 4, Paul notes that there is but one God and Father of all, who is above all and through all and in all—a statement of the universality of holiness, whatever metaphors, or persons, may be used to express that sacred power. Now in this fourth chapter, Paul turns towards the implications of that for our ethical and moral lives, attitudes, and behaviors. In effect, Paul says in this letter that we are all pilgrims on the way, the holy way, and that we journey toward that holy vision of the world that Christ offers as we journey in the way, the pattern of Christ. So to conclude: just here is the word of wisdom and hope for the impending irrelevancy of Christianity, and it is THE word that our our Disciples of Christ forbears captured so remarkably in the 19th century, that made us by 1930s one the fastest growing denomination in the country. 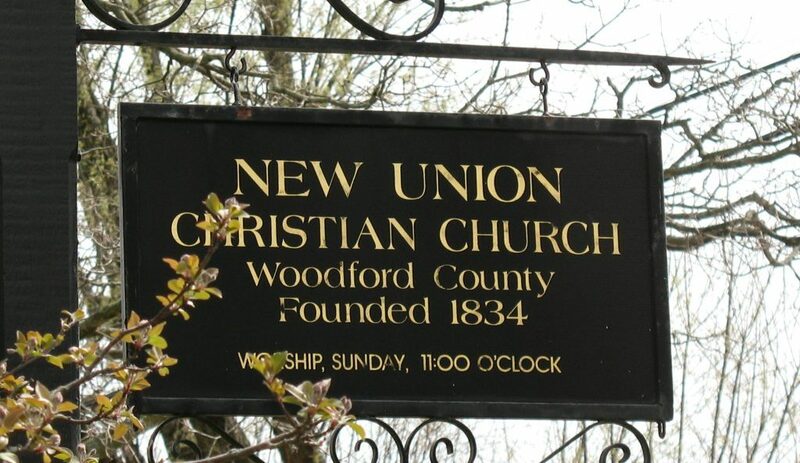 Now, of course, we have fewer members of our churches than we did in the 1870s. What our Disciples of Christ founders knew was that doctrines and moral codes were not central, could NEVER be central, but that we should have “no creed but Christ”, which is to say that Jesus, whom we call the Christ—the Savior—saves by offering us the WAY to live, the TRUTH about life, and the only LIFE that makes sense in a world where each of us is an alien, an other, a stranger. If we want to move back to relevancy, we need to recapture what our forbears in the 19th century had come to understand: living the life as patterned for us by Jesus is central, and doing so gives us faith and hope in this life and for whatever life there is to come. And second, they were convinced that a learned, articulate, studious, biblically knowledgeable laity—alongside a learned clergy—who utilize reason, coupled with careful study of scripture using all the tools of modern scholarship—are necessary for the church to be that body, that organization which will offer hope, insight, meaning, unity, and, yes, civility, to a barbarian world. We must grow up, the Apostle Paul wrote, into him who is the head, into Christ. We cannot be satisfied to let someone else do our thinking, our believing for us. We must be those who set aside our fifth grade concepts of God and Jesus and Scripture. We must be those who use the minds God gave us to understand the world and the many sacred scriptures of humankind. We must be those who can articulate what we believe, and why we believe it. Not for the sake of our little church, our little denomination, or even for the sake of the Christian religion, but for the sake of the world that it might be built up in love and peace at last. “Each us was given grace…he gave gifts to his people…to equip the saints for the work of ministry (a word that means service or servant leadership),…until all (meaning all humanity) come to …the measure of the full stature of Christ.” Grace and gifts. We have them. Let’s use them. Amen.